Etoro is probably not a scam, but their business practices are extremely bad, plain and simple. -Super nice customer service BEFORE a deposit is made. AFTER the initial deposit, customer service is just hell. -Complicated process to verify account. -Extremely difficult to WITHDRAW money. I do believe that any good financial-related company should make withdrawals easy once account is verified. eToro is just horrible in this area. -BEING REGISTERED IN CYPRUS IS THE SAME THING AS NOT BEING REGISTERED. Don't pick this company if you value your hard-earned money. Don't TRUST the positive reviews (written by eToro employees). It looks like a good website until you want to withdraw your money and need the customer support for help. I'am waiting a month now to get my money back, but it's still not on my account. I've made 5 withdrawals starting in 25th of April, I waited till 10th of May, nothing received! I told my account manager about that, then I've received email from etoro telling me that there was a technical issue and they solved it and I will receive my withdrawals in 5-8 business days. After 9 business days I still not received any thing, so, I sent to customer service about this. they told me that your withdrawals have been processed successfully in the 1st date that you made the withdrawal! I don't understand how they told me in the 1st email that there was a technical issue delayed the transactions and in 2nd email they said that there wasn't a problem! After this, I post on etoro asking about how to complain about this, and I blocked. Etoro, not a broker that I would recommend!! I didn't stay with Etoro very long as I only took it out to join a signal provider, which is another story, however I decided to withdraw all my funds from Etoro, but found it very difficult to find how to withdraw funds, I ended up having to email support, after a few days they refunded my deposit, less €10 as a fee, this is the only broker I have come across that takes €10 fee on a Visa card withdrawal, not a recommended broker from my point of view!! Also, to add to this, I didn't like the platform they had as I have been used to MT4! I know this company is in ISREAL but damn they really really are cheap!!! PAMM accounts usually pay around 12% of gains to master investors, etoro refuses to use a percentage, and instead uses very very very low dollar amounts. You are also forced to stay at that super low amount for months. They offer you 50% rebate AFTER 6 MONTHS, you can get up to 50% rebate right away just by signing up and using cashbackforex and many brokers!!!!! They also charge for withdrawals. And they limit the amount that people can invest in you. There is serious money made in people following professional investors. At etoro, the professional investor does not get it, the follower does not get it, so whos left? eToro! P.S. I recall about 4 forex brokers closing and taking everyones money in recent memory, all were from isreal. This is the only broker I know of that is still operating.....for now. If you choose to deposit your money with them, good luck. I'm surprised to see so many overwhelmingly negative reviews of eToro. One thing I agree on is their OLD platform was MUCH better. It's now very "social" trading oriented and not like a professional Managed account. However, you can still find SOME Good traders on there. It's not their fault if the traders are bad, but they obviously don't vet traders, which is unfortunate. Their support is also a bit dicey, but they do have some good traders and my portfolio is up overall. Withdrawals also processed successfully two times, it does generally take 2-3 business days. Etoro Cancel my withdrawal of $1283 saying that they have terms of promotion that if you withdraw initial deposit we will cancel profits and bonus as well. there is no such term is still available in etoro promotion terms. Received reply from etoro representative 'Anastasia' during chat. ''As stated in our terms and conditions, once you start trading, you are first investing your real funds. Once the real funds are either used up or invested into position, you start trading with the credits. According to our finance department, you have withdrawn the initial deposit which was associated with promotional credits, therefore we have deducted the credits and the profit as well'', Does this make sense? if I have withdrawan initial deposit etoro have a right to cancel any bonus related to initial deposit but not to cancel profits as well. Once you join up they sell your personal details to other companies. You'll be pestered forever by cold callers trying to sell you investments and other s***. The site itself is ok as a learning area for beginners nothing more which is why I give 2 stars. Very displeased with etoro. When markets go favourably their way, they imediatly take effect, when its not, grafics stop...and become extremely latent...I always use metatrader to check up. Other isue, last friday I set up an oil buy order, with a limit loss...surprise, surprise on this Monday when i saw all my money gone and negative credits...very unethical...dont use etoro! Etoro is a a scammer they closed my account with 500$ after withdraw request, they tell me that i allowed a 3rd party to trade on my account, and this is allowed. Etoro started out great but soon went downhill in my estimation unfortunately.The bonus money is damn near impossible to cash out, copy traders stats are minipulated and misleading and very few make any money in the long run, I had a rather large sum of money under a copy trader which experianced a large drawdown Etorro then prevented this trader from opening any more trades which ment he wasn't able to hedge the position and protect the account thus insuring the account blew and my money was lost, After speaking to various members of eToro's customer services I feel I was lied to as they changed there excuses many times. (The small print in there user agreement allows them to do anything they wish without notice) Be very aware and stay well clear of this broker. Also in times of high volitile market movements the platform very convenientlying goes down for maintainable which denies traders from being able to access there account. Good company. Etoro has a clean user interface/trading platform. Legit, so far as I know. 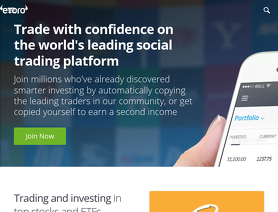 I have used etoro for over a year now and i feel its a good platform. They process my withdrawal requests (to PayPal) within 24 hours, they have various promotions that allow me to get extra money when i make deposits and the platform is easy to use once i learned how to use it. This is not to say that i didn't have problems with while using etoro. I blew all my investment within the first three months but this was due to using very high leverage and trading on hunches. ETORO SCAMMERS! I invested US50 and now I want to withdraw they are full of stories.My money has shrunk, they have take U$5 per month because I have not been trading - this is illegal in every sense of the word & now I have US25 left, they will not refund me as you can only withdraw U$30 and above. eToro charged me 12%!! of my trade volume, for an overnight gap, that happend to go in my favor. They closed my fixed position when was only 52% before from SL target, so i decided to not deposit money again to this site. They also charge $25 if you will withdraw all your money . This site also has take profit from spread. Israeli company with one thing in their mind ....to rob you. Suspicious unauthorized activity on their platform is set to eat your capital.No explanation given and dropped communication.Filed a case. Relentless obstructionism during withdrawn.You won t get your profit is the least.Is when you can get what is left out that is going to hurt.Filed another case on this matter. for the love of God stay away from this lot they will turn your life upside down. Disable person here loosing his health over etoro experience. I declare that I was a user in the eToro platform under the username : chikh2012 and on the December 3, 2013 I received an email from eToro saying that I have not complied with the conditions of uses ( multiple accounts ) and that my account will be closed within 14 days. This period was given to modify stop loss and take profit of my two open positions to avoid financial damage and they said that this decision is final and irrevocable. A few days after eToro has informed me that I have never made ​​a deposit and I started trading by using a coupon of $ 20 and it means that i can't withdraw my profits so I reminded to the support that any user who used this coupon can withdraw his profits . EToro then told me that my case is different from the other users because I didn't respect the conditions of use , so I said to the support that they have not mentioned it in their final decision so they can't change it now . As a result of the facts mentioned above I ask eToro to respect their own final decision to be able to withdraw my funds . A non-commercial free speech website, which also links to ForexPeaceArmy. We spread the truth about eToro to the world, to prevent any more damage to their traders. You are all welcome and any support and help is appreciated (especially from FPA itself)! Thanks a lot and only united we stand versus all the scam and unreliable (wannabe-)brokers!